We all know the general rule of thumb that all blog posts should have an image. It helps to promote the post in various channels. Lately I’m approaching my blogs as a thought space where I post more frequently to get my ideas published. With more posts, these ideas get developed further. The only thing is that sometimes I just don’t have an image for the post. Many times I haven’t published a full blog post, because there is simply no image for it. The post gets buried among my 1,280 drafts in Evernote. Yipes! So now I’m posting, and if there is no image, that’s ok!–except for on Linkedin. 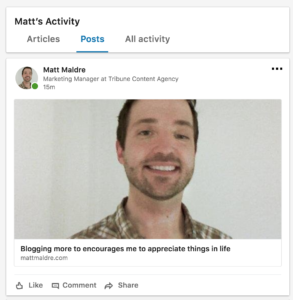 When blog post with no image is shared on Linkedin, they like to grab my headshot and make it REALLY BIG. Uhhhhh. Not really what I want coming across in my contacts feeds, thanks. For now, I won’t be sharing posts without an image to Linkedin. I’m sparing you, my beloved readers on Linkedin.